From its initial insipid beginnings in 2001, NATA Online grew organically (and, at times, very rapidly) to become almost too big for its webmaster to manage. In late 2009, the decision was taken to cut back on quantity and get back to focussing upon providing a quality online resource for Scotland fans. This page explains the evolution of the website, and looks at some of the features that have now been discontinued (although many remain online as part of the site archive). Inspired by the Notts Scots early yahoo site, Paul became determined to get NATA on the web as soon as he had a PC. 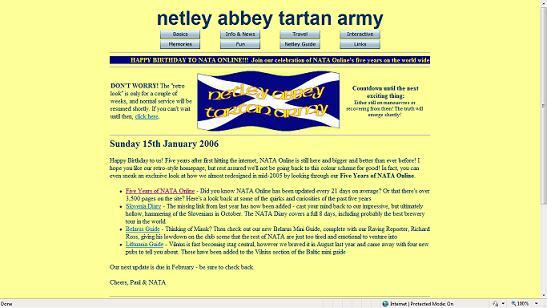 After buying one in the 2001 January sales, NATA first hit the internet later that month with a very basic yellow homepage, complete with retro navy blue Times New Roman text. Unfortunately, no genuine pages from the site’s original incarnation have survived, however below is a screen-shot of the look and feel of the site, taken from the 5th anniversary tribute homepage. The site had a pretty flat structure in these days, with limited photos (for several reasons: we hadn’t been on many trips; digital cameras were not widespread, so printed photos were scanned in; web space was restrictive) and several “fun” features such as risqué song lyrics and a spoof packing checklist. After a few trial and error experiments, Paul found a winning formula and continued to expand by gradually adding to the diaries and scanning in more photos. The very first diary accounts only ran to a couple of paragraphs (and they’re still there), but as more and more people gave encouraging feedback, these grew into the mini-novels they are today (3,000+ words for both Iceland and the Faroe Islands). Likewise, the photographs have become more numerous with the advent of accessible digital photography. In 2003, the site received an overhaul that was to last for nearly the next 7 years. The background became navy blue, the text became yellow or white, and even the side scroll bars took on the “corporate” look. This was augmented a couple of months later with an “away” colour scheme (below), allowing most visitors (dependent on their browser) to view slightly larger navy text on a white background. A few years later, the Scottish Football Association adopted a similar gimmick for their own website! Along the way, as Paul and his fellow NATA members expanded their travels, a number of people (both friends and complete strangers who had found the site via a search engine) were asking for travel and pub tips to enhance their own city breaks – Prague was amazingly popular. In response to this, and to typing out the same email about Prague pubs a dozen times, Paul decided to create a Travel Guide section, and this has proved to be one of the more popular areas of the site. The downside with this is the speed with which information dates, particularly for cities that have been visited only once or twice, however the trick here is to remind the reader of this fact and warn them that the information could well be already out of date. The streamlined 2010 version of the website has stripped away the dark colours of its predecessor version and has taken the colours of the NATA crest (itself only designed in 2004) as its inspiration. 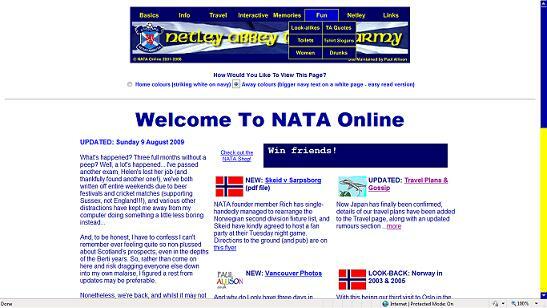 An early draft of the new design was roundly rejected by NATA members in May 2005, but having become frustrated with the effort to keep the mammoth site up-to-date and fit for purpose, Paul decided to dust down the idea, bring it up to date with a new navigation system (replacing the mobile phone incompatible flash navigation bar) and radically reduce the number of active pages. Other features such as the site search, the countdown to the next game and the newsletter have also been discontinued (for now, anyway) as these all added to the time taken to keep the site fully up-to-date. So as to allow the previous site’s ideas and content to not disappear into the ether, the vast majority of the old pages have remain accessible via the Web Archive (although these have largely remained in the Mark #2 format).